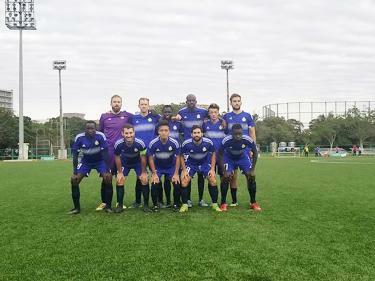 Royal Blues Taipei line up ahead of a match in an undated photograph. community with a new regime taking over at governing body the Chinese Taipei Football Association (CTFA) last year, but the result of this season’s Taiwan Football Premier League (TFPL) relegation battle has left a team in limbo with no league to play in and has also exposed other problems that urgently need fixing in the coming months. As usual, this season was a two-horse race for the title in the TFPL between Taipei Tatung and Kaohsiung Taipower, the two teams with the strongest corporate backing and financial clout. The former were crowned champions with 54 points, while the latter were runners-up with 44 points.